The Gold Coast School of Construction is the leader in construction education for both Registered County and State Certified contractors in the state of Florida. Students enroll with Gold Coast because they have one goal, to pass the state exam and become a licensed General Contractor! Our curriculum, methods, and team of experienced instructors are dedicated to helping every student achieve that goal. Complete details about our General Contractor exam prep program can be found below. Please contact our helpful Career Counselors at 1-800-732-9140 for more information. We are happy to assist. The Gold Coast curriculum is an in depth review of all state examination topics giving you the knowledge and confidence needed to get your General Contractor’s license. Our materials are continuously updated to reflect exam and code changes, and are direct, yet simple to understand. Our instructors are licensed practicing professionals including Contractors, Architects, Engineers, Building Inspectors, and OSHA trainers who care about your success. In the state of Florida, becoming a licensed state certified general contractor involves meeting the age, credit, and experience/education requirements before licensure will be granted. The experience must be verifiable and under a license contractor in the areas of foundations or slabs, masonry walls, steel erection, elevated slabs, precast concrete structures, column construction, and framework for reinforced concrete. To register for the Classroom Based Contractor Exam Prep Program, use the “Schedule Your Course” box above, click the “Register Now” button next to the course below, or call our helpful Career Counselors at 1-800-732-9140. 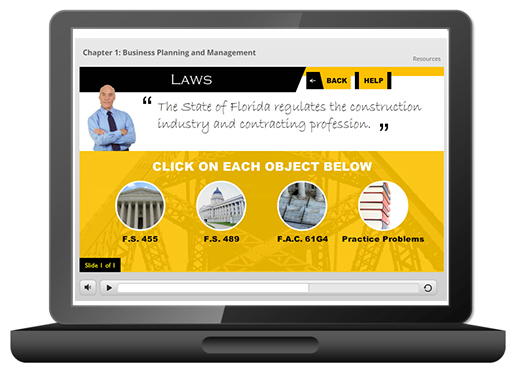 Your Classroom Based Contractor Exam Prep Program will be divided into 3 parts. Your tuition is valid for 1 year allowing you plenty of time to attend as many classes as you would like during this time frame. Classroom instruction (Offered in both English and Spanish). You are welcome to attend as many sessions as you would like during your tuition period. Bring your questions and we will show you how to work through to the answer together. Weekend Exam Reviews offered two to three times a month. (Included FREE in your tuition). You will go through the material module-by-module gaining a mastery of how to navigate your state reference books, making passing your state contractor exam a breeze. Remember, the state licensing exam is an open book exam. The key to success is to develop the base knowledge, and combine that with familiarizing yourself with the various state exam books so that you can find the answers quickly. This online course is designed to enable you to do just that.